Merry Christmas! We hope you enjoyed the holiday. We had a lovely day. A rare snowy week in Seattle has paralyzed the city and kept us mostly confined to the one mile radius around our house. I guess 27 snow plows aren’t enough to keep the roads of an entire city clear. I have to agree, snow in Seattle does force people to rediscover their legs. We’ve seen more people carless this week than normal. This seems kind of harsh, but it’s nice when people are scared or ill equiped to drive. The streets have been so quiet and serene. We could get used to these car-free roads. Wouldn’t it be nice if we could get rid of the snow and have the roads to ourselves? To cope, our focus has been fun: we’ve done a little sledding, drank a lot of cocoa, and built a giant seven-foot-tall igloo in our front yard. Tim and I got a little obsessed with completing the igloo. The kids quickly lost interest but we remained tenacious. 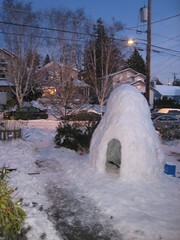 One night, we put the kids to bed, and spent our evening engaged in some late-night igloo building. 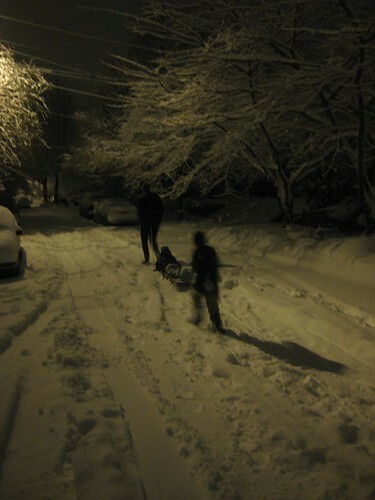 We packed-and-stacked five-gallon-bucket snow bricks until one AM. I’m sure our neighbors think we are even more nutty than they thought before. I have to say, I’m ready for all of the snow to melt. The kids and I haven’t been doing much any riding this week and we’re getting a little stir crazy. Tim ventured out on his studded–tire equipped Xtracycle a few times and found the conditions less than enjoyable. The icy hard pack has given way to dirty slushy rutted slop. Yuck. It looks like we can expect some old-fashioned Seattle rain by the weekend. I’m looking forward to it! I promise I won’t complain about the drizzle for at least a week. This entry was posted in alternative transportation, bicycle neglect, bikes, seattle, sustainability, weather. Bookmark the permalink. Truly a beautiful igloo you’ve built, there – but no photos of the construction? Too obsessed for pictures, no doubt. I, too, have found the transitional conditions to be abysmal for any sort of travelling; too bad I have to get places. Riding over chunks and ruts of ice into deep, dirty puddles and huge drifts of nasty slush is no one’s idea of fun. Not only that, but as soon as the roads start to clear off, all the cars come back out, and they’re all in a hurry. Oh, well; it was nice while it lasted. Stay safe! Having 27 snow plows is one thing– knowing how to USE them is another. ha ha. 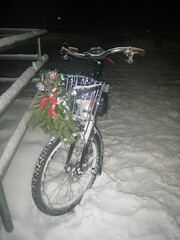 but no, ice and slush is no fun..
dry packed snow and ice + studded tires– very friendly.